It’s Wednesday, and time for another Minecraft Java Snapshot! 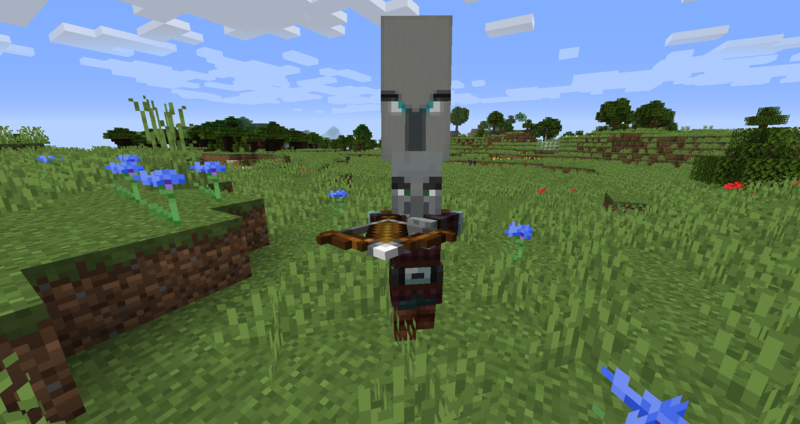 18w45a brings a few new features relating to the second half of the update’s name: Illager Patrols. It also adds Scaffolding, an update to sign editing, and some changes to the /drop command (which doesn’t exist anymore). Plus performance updates and bug fixes (as is normal with these things). These Illager Patrols look deadly. 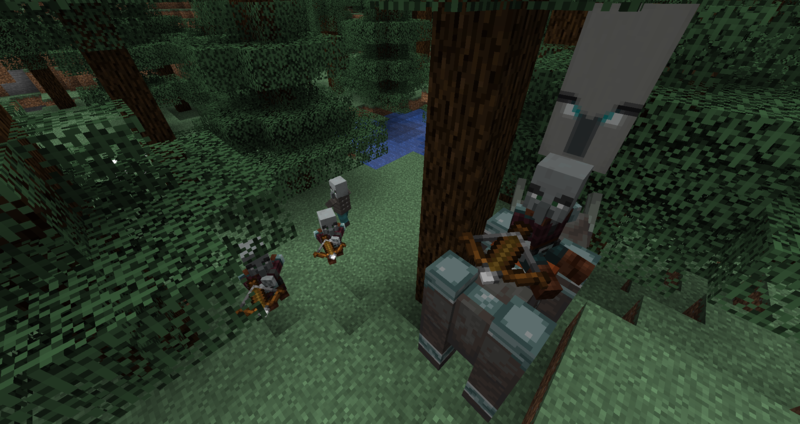 The new Illager Patrols bring added danger to the game, though admittedly with some bugs in this first iteration. 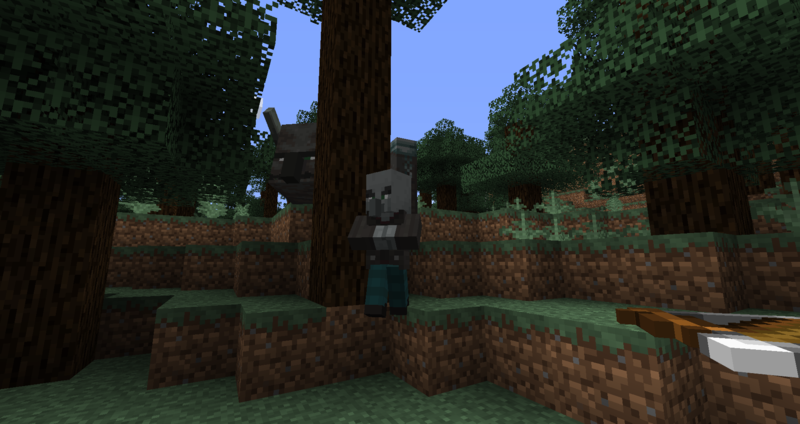 Illagers will spawn randomly throughout the world in Plains, Taiga, Deserts, and Savannas in groups of 5 mobs – 4 Illagers and 1 Illager Beast. Notice that I said “Illagers” and not “Pillagers”. The Illager Patrols will actually spawn sometimes with other Illager mobs, like the Vindicator in the screenshot above. Though, I’m not sure if other Illagers will also spawn in with them, as I only found Vindicators as part of the group. It only took a few moments to find the first Illager Patrol, but it was a little lackluster with 1 single Patrol Leader (with an Illager Banner on his head). Pretty sure that’s just a bug that will be fixed, since they’re supposed to spawn in groups of 5, though I did find another group a couple hundred blocks away with only 3 Illagers. Maybe he got lost? Bugs: Currently, the spawn rate of these Patrols might be a little high. I found 3 Patrols within 100 blocks of each other, and another just a few minutes later in the distance. The Pillagers also had a strong tendency to shoot the Illager Beast, though they didn’t turn and fight each other. The Beast itself had its own issues, constantly getting stuck on trees and spinning around in circles not knowing where to go next. It was amusing, to say the least, but the Patrol AI will probably get a fix in a future Snapshot. As a small suggestion, it would be cool if these Patrols fought Zombies (and their variants) as well as Villagers. If you like this idea, why not give it an upvote on the Minecraft Feedback Site? Bamboo is known as a strong building material, but should it be able to hold up an Illager Beast? I’ve already taken a look at Scaffolding in the Minecraft Bedrock Beta release, but I’m super glad to see it here in Java finally. This is going to be a super useful tool, even with the limitations for how far you can extend it. Build up, work on your project, climb down and break the bottom block to remove it all. Simple as that. Scaffolding can be stacked up vertically as high as you’d like, but it can only go out horizontally 4 blocks before it is affected by gravity. After that point, the Scaffolding will drop to the ground, and you’ll need another tower to support the next 4 blocks. That’s not so much of a problem, though, as climbing up or down Scaffolding is fast. Go up by holding the space bar and head back down by holding the left-shift key. Scaffolding can also be waterlogged, which might be useful for… something. It’s not a bad thing, at any rate. There’s a note in the changelog that editing signs is not easier with a movable cursor, but I’m not entirely sure what that’s referring to (leave me a comment if you know). When I was trying it out, I couldn’t use the mouse to click anywhere within the sign to edit freely, though I could use the arrow keys to get where I needed to go. Also, I didn’t mention the new Wither Rose last time, but this little guy is nasty. Don’t go too close or you’ll get got! The Wither Rose has had a bug fix where it was Withering players in creative mode. Oof. If you’d like to see the full list of bug fixes and other changes, click the button down below! There’s plenty more to see for those of you who like the details. Remember, these snapshot releases are full of bugs, so DON’T start a world with them if you are afraid of crashes or problems. For those of you risk takers who want to try out the new features for yourself, you can download the latest snapshot at the link below (scroll to the bottom of that page). Don’t forget to send Mojang feedback through the official channels! Huh I didn’t think pillagers would spawn everywhere I thought it would be something like the event where a group of zombies spawn around a village. How will they get to the villages then? I wondered that at first, too, but the Patrols will only spawn in Biomes where Villages can spawn. They also currently spawn so frequently that the likelihood that they find a Village is pretty high, IMO. Not sure if they path towards Villages, though. I should have tested that. Java Village and Pillage FULL RELEASE Next Week?